We're about to enter our second full season of whale watching adventures in San Diego. We’re about to enter our second full season of whale watching adventures in San Diego. Last year we were able to spot and sail with whales on nearly every charter. There was one outing where we didn’t spot whales, but we did cruise along with a small pod of dolphins. We see a variety of sea life on every charter. The most common are birds and sea lions. We make it a point on most outings to cruise by the bait barges where there are usually dozens of sea lions lounging in the sun. 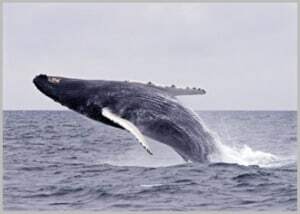 We will be doing whale watching tours every Saturday beginning in January and running through March. Please see our calendar here for all of the dates and times. You can click on the date / time of any outing and get more details about the tour. We hope that you and your friends can join us soon for one of these exciting adventures!